In considering how best to implement parent-delivered communication interventions for young children with autism spectrum disorder (ASD), there is a growing body of evidence supporting the need to examine children’s pre-treatment factors (e.g., verbal skills, joint attention skills, imitation skills) as potentially influential variables on intervention efficacy. Nonetheless, we know little about the mechanisms by which pre-treatment parent factors may influence communication outcomes, limiting our ability to make optimal decisions in tailoring communication intervention to the strengths and needs of children with ASD and their families. There may be much to be gained from examining the potential influence of pre-treatment parent characteristics on communication outcomes for children with ASD. To these ends, our recent work published in the Journal of Autism and Developmental Disorder1, examined father-child and mother-child interactions in order to investigate concurrent associations between the language skills of children with ASD and two potentially influential variables in parent uptake of communication intervention, parent gender and broad autism phenotype (i.e., aloofness, rigidity, pragmatic language deficits). Specifically, we examined concurrent relationships between two child measures (i.e., engagement and language skills) and three parent variables (i.e., parent gender, parental BAP characteristics, and parent verbal responsiveness). The importance of parent responsiveness for communication outcomes for children with ASD has long been recognized2,3,4. Indeed, longitudinal studies and intervention studies have documented that mothers’ use of language input which follows the child’s lead and maps to the child’s focus of attention is a significant predictor of language outcomes for children with ASD5,6,7. Given that these studies show parental verbal responsiveness to be a predictor of language outcomes for children with ASD, it follows that increasing parent responsiveness is often a target of early communication intervention for children with ASD. However, results from studies of parent-implemented intervention have been mixed, with some studies reporting changes in parent behavior but not child outcomes whereas others report changes in both parent behavior and child communication outcomes8,9,10. For example, in a recent randomized controlled trial (RCT) Green and colleagues11 examined pre-emptive interventions for young children at familial risk of ASD. Fifty-four infants between 9 and 14 months of age were assigned to treatment or control group or treatment group receiving a 12-session parent-mediated social communication intervention. Although findings showed no effect of intervention on categorical diagnostic outcome or formal language measures, the researchers reported significant overall effects for parent responsiveness (e.g.. nondirectiveness/synchrony) and child attentiveness/communication initiation. Overall, findings from this study and others suggest that not all parents acquire the same level of proficiency in using targeted strategies. In addition, parents differ in their use of these strategies over time, and some may not implement targeted strategies with sufficient intensity to affect children’s long-term communication outcomes12, 13, 14,15. Findings from these studies and others were examined in a recent metanalysis of parent-implemented intervention, which reported small improvements in ASD symptom severity, socialization, and cognition and only minimal improvements in communication and language across RCTs16. Parent-implemented interventions for young children with ASD aim to improve child communication skills through changes in parent behavior, and thus differences found in intervention outcomes may be related to the fit of treatment strategies to the pre-intervention characteristics, needs and strengths of participating parents and families. For instance, in a recent RCT, Wetherby and colleagues17 showed individualized home-based parent coaching to be more effective than parent training delivered in a group setting for improving on child outcome measures of social communication, adaptive behaviors, and developmental level. In another example, Siller, Hutman and Sigman identified maternal insightfulness as an influential pre-intervention parental characteristic18. In their intervention targeting responsive parent strategies, the authors reported that mothers who initially demonstrated insightfulness into their children’s thoughts, feelings, and behaviors increased their synchronous responses to their young children with ASD, whereas mothers who were initially noninsightful did not change in responsiveness if assigned to the intervention. In a follow-up a study, the research group reported that maternal insightfulness increased post intervention for a subset of parents who showed emerging, but not yet established, insightfulness19. Thus, tailoring intervention to fit the needs of individual families may be more effective in improving child communication outcomes than a one-size-fits-all approach, and pre-intervention parental variables may influence treatment outcomes. Parent gender is one important pre-treatment variable to examine, as fathers now take an increased role in childcare and show a high level of engagement in education and learning for children with ASD20, 21. However fathers have been largely overlooked in ASD intervention research22. Examining the specific contributions of fathers is important, given that fathers of both children who are typically developing and at risk use language models that are distinct from mothers and thus may influence child language in unique ways, including using vocabulary that is more varied and abstract, higher-level syntax, and more frequent questions in communicative exchanges with their children23, 24, 25, 26. It may be the case that fathers’ communication styles is facilitative for children with ASD, who have impaired awareness of the impact of their communicative signals on others. In addition to gender, we considered another potentially relevant parent variable, the broad autism phenotype (BAP). In designing optimal communication interventions for children with ASD, it is also timely to consider the findings of research investigating potential relationships between parental BAP and child communication skills. The BAP refers to the phenotypic expression of elevated, but diagnostically subthreshold, levels of autism-related symptoms among relatives of individuals with ASD27. Researchers have defined three primary components of the BAP: (a) aloofness; (b) rigid personality; and (c) pragmatic language deficits28. Aloofness is characterized by diminished interest in or enjoyment of social interaction; rigid personality is defined as difficulty adjusting to change; and pragmatic language problems refer to deficits in the social use of language, resulting in reduced effectiveness of communicative exchanges. Studies suggest that BAP characteristics can impact the communicative effectiveness of parents during exchanges with other adults29, 30, 31. The BAP may also influence parent-child communication. Thus, in our study we examined concurrent associations between parental BAP characteristics, and child engagement and language skills. In addition, we examined whether associations between parental BAP characteristics and child language remained significant after accounting for parental verbal responsiveness. Sixteen children with ASD (12 boys and 4 girls) and their mothers and fathers participated in this study. Child ASD characteristics were not examined in this study, however for purposes of determining eligibility for inclusion in the study, child participants met the following criteria: (a) chronologic age between 36 and 69 months; (b) existing clinical diagnosis of ASD, confirmed by the cutoff scores on the Autism Diagnostic Observation Schedule32; (c) no severe sensory or motor impairments; and (d) no identified metabolic, genetic, or progressive neurological disorders. In addition, each participating child was required to have two biological parents, or married caregivers, residing with the child continuously since birth. What do the findings tell us? First, associations found between frequency of child-initiated engagement and parental BAPQ scores showed that children in the study initiated less engagement with mothers who had higher Aloof and Rigid BAPQ scores. In contrast, fathers’ Aloof and Rigid subscale scores were unrelated to child-initiated engagement. Interestingly however, a positive association was found between frequency of child-initiated engagement and fathers’ scores on the Pragmatic Language BAPQ subscale. This suggests that children in this study used more visual and tactile engagement with their environment when they were observed with fathers whose pragmatic language characteristics more strongly resembled those seen in individuals with ASD. Second, similar to findings with child-initiated engagement, child language scores were also negatively associated with mothers’ scores on the Aloof and Rigid BAPQ subscales. However, negative correlations between child language scores and mothers’ scores on the Aloof subscale were no longer significant, after controlling for mothers’ responsive verbal behaviors. This suggests that increased frequency of responsive parent verbal behavior potentially mediates the relationship between aloof parental traits and child communication skills. 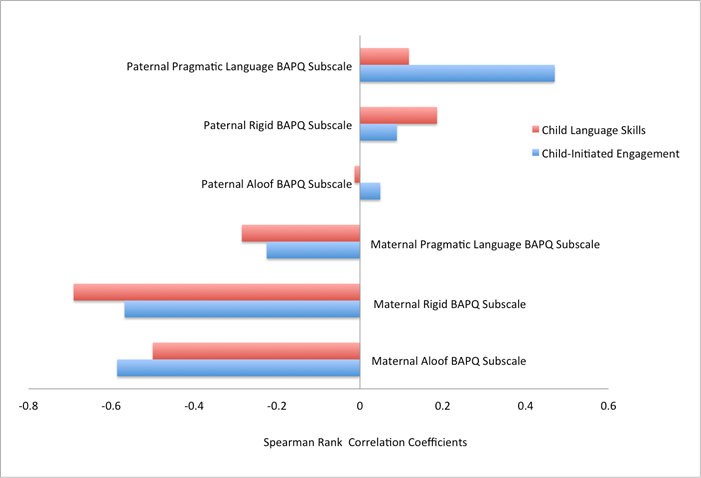 In contrast, none of the paternal BAPQ subscale scores were associated with child language scores (Figure 1). The implications for communication intervention with young children with ASD are twofold. First, findings from this study highlighted the potential benefits of a novel intervention approach, in that parents who demonstrate characteristics of the BAP (i.e., aloofness, rigid personality, pragmatic language problems) may benefit from coaching models that are tailored to their unique social communication needs, strengths, and personalities. Individualizing parent coaching to fit parent pre-intervention characteristics in this way may increase the fidelity and effectiveness of parent-implemented intervention, resulting in improved social communication outcomes for children with ASD. More specifically, parents who meet criteria for Aloof characteristics of the BAP may benefit from interventions focused on increasing verbal responsiveness by coaching parents to share their child’s focus of attention and model language that linguistically maps to the child’s focus. Whereas for parents who meet criteria for rigid BAP characteristics, coaching parents to use a variety of flexible responsive verbal behaviors in order to better scaffold child engagement and language learning may be more effective. Overall, results shared in this paper provide early evidence that supports the need for continued research to identify responsive strategies that are both beneficial to children with ASD and amenable to parents and caregivers. Communication intervention will not be effective if it does not fit the strengths and needs of children with ASD and their families. Flippin M, Watson LR. Parental broad autism phenotype and the language skills of children with autism spectrum disorder. Journal of Autism and Developmental Disorders. 2018. https://doi.org/10.1007/s10803-017-3431-7. Landry SH, Smith KE, Swank PR. Responsive parenting: Establishing early foundations for social, communication, and independent problem-solving skills. Developmental Psychology. 2006; 42: 627-642. Spiker D, Boyce G, Boyce L. Parent-child interactions when young children have disabilities. International Review of Research in Mental Retardation. 2002; 25: 35–70. Warren SF, Brady NC. The role of maternal responsivity in the development of children with intellectual disabilities. Mental Retardation and Developmental Disabilities. 2007; 13: 330-338. Siller M, Sigman M. The behaviors of parents of children with autism predict the subsequent development of their children's communication. Journal of Autism and Developmental Disorders. 2002; 32: 77-89. Siller M, Sigman M. Modeling longitudinal change in the language abilities of children with autism: Parent behaviors and child characteristics as predictors of change. Developmental Psychology. 2008; 44: 1691-1704. McDuffie A, Yoder P. Types of parent verbal responsiveness that predict language in young children with autism spectrum disorder. Journal of Speech, Language and Hearing Research. 2010; 53: 1026-1039. Haebig E, McDuffie A, Ellis Weismer SE. The contribution of two categories of parent verbal responsiveness to later language for toddlers and preschoolers on the autism spectrum. American Journal of Speech Language Pathology. 2013; 22: 54-70. Yoder PJ, Watson LR, Lambert W. Value-added predictors of expressive and receptive language growth in initially nonverbal preschoolers with autism spectrum disorders. Journal of Autism and Developmental Disorders. 2015; 45: 1254-1270. Carter AS, Messinger DS, Stone WL, et al. A randomized controlled trial of Hanen’s “More Than Words” in toddlers with early autism symptoms. Journal of Child Psychology and Psychiatry. 2011; 52: 741-52. Green J, Charman T, Pickles A et al . the BASIS team. Parent-mediated intervention versus no intervention for infants at high risk of autism: A parallel, single-blind, randomised trial. Lancet Psychiatry. 2015; 2: 133-140. Rogers SJ, Estes A, Lord C, et al. Effects of a brief Early Start Denver model (ESDM)-based parent intervention on toddlers at risk for autism spectrum disorders: a randomized controlled trial. Journal of the American Academy of Child and Adolescent Psychiatry. 2012; 51: 1052-65. Schertz HH, Odom SL, Baggett KM, et al. Effects of joint attention mediated learning for toddlers with autism spectrum disorders: An initial randomized controlled study. Early Childhood Research Quarterly. 2013; 28: 249-258. Green J, Pickles A, Pasco G, et al. Randomised trial of a parent-mediated intervention for infants at high risk for autism: longitudinal outcomes to age 3 years. Journal of Child Psychology and Psychiatry. 2017; 581330-40. Nevill RE, Lecavalier L, Stratis EA. Meta-analysis of parent-mediated interventions for young children with autism spectrum disorder. Autism. 2018; 22: 84-98. Wetherby A, Guthrie W, Woods J, et al. Parent-implemented social intervention for toddlers with autism: An RCT. Pediatrics. 2014; 134: 1084-1093. Siller M, Hutman T, Sigman M. A Parent-mediated intervention to increase responsive parental behaviors and child communication in children with ASD: A randomized clinical trial. Journal of Autism and Developmental Disorders. 2013; 43: 540–555. Siller M, Hotez E, Swanson M, et al. Parent coaching increases the parents’ capacity for reflection and self-evaluation: results from a clinical trial in autism, Attachment & Human Development. 2018; 20: 287-308. Pleck JH, Masciadrelli BP. Parental involvement by U.S. residential fathers: Levels, sources, and consequences. In: Lamb ME, editor. The role of the father in child development. New York: Wiley; 2004. pp. 222–271. Potter C. "It's the most important thing--I mean, the schooling": Father involvement in the education of children with autism. European Journal of Special Needs Education. 2016; 31: 489-505. Flippin M, Crais ER. The need for more effective father involvement in early autism intervention: A systematic review and recommendations. Journal of Early Intervention. 2011; 33: 24-50. Flippin M, Watson LR. Fathers’ and mothers’ verbal responsiveness and the language skills of children with autism spectrum disorder, American Journal of Speech Language Pathology. 2015; 24: 400-410. Leech KA, Salo VC, Rowe ML, et al. Father input and child vocabulary development: The importance of wh-questions and clarification requests. Seminars in Speech and Language. 2013; 34: 249–259. Pancsofar N, Vernon-Feagans L. Mother and father language input to young children: Contributions to later language development. Journal of Applied Developmental Psychology. 2006; 27: 571-587. Rowe ML, Coker D, Pan BA. A comparison of fathers’ and mothers' talk to toddlers in low-income families. Social Development. 2004; 13: 278–91. Folstein S, Rutter M. Infantile autism: A genetic study of 21 twin pairs. Journal of Child Psychology and Psychiatry. 1977; 18: 297–321. Bishop DV, Maybery M, Maley A, et al. Using self-report to identify the broad phenotype in parents of children with autistic spectrum disorders: A study using the Autism-Spectrum Quotient. Journal of Child Psychology and Psychiatry. 2004; 45: 1431-6. Hurley RS, Losh M, Parlier M, et al. The broad autism phenotype questionnaire. Journal of Autism and Developmental Disorders. 2007; 37: 1679-90. Pickles A, Starr E, Kazak S, et al. Variable expression of the autism broader phenotype: Findings from extended pedigrees. Journal of Child Psychology and Psychiatry. 2002; 41: 491-502. Piven J, Palmer P, Jacobi D, et al. Broader autism phenotype: Evidence from a family history study of multiple-incidence autism families. American Journal of Psychiatry. 1997; 154: 185–190. Lord C, Rutter M, DiLavore P, et al. Autism Diagnostic Observation Schedule. San Antonio, TX: Western Psychological Services. Western Psychological Services. 2006.